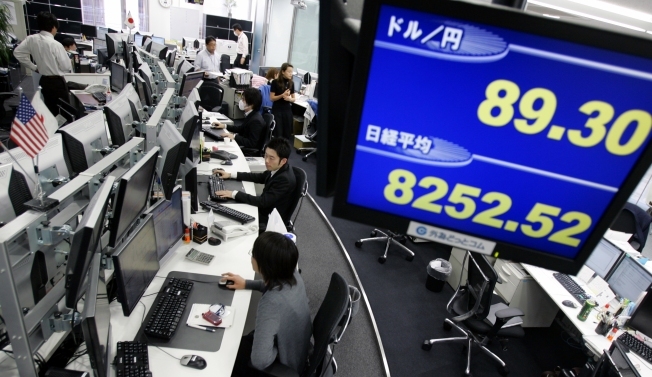 Money traders work as U.S. dollar is traded at 89.30 yen and Japan's benchmark Nikkei 225 stock average is at 8252.52 points Friday afternoon. BANGKOK, Thailand - Asian markets plunged Friday after a U.S. government rescue of Detroit's ailing automakers collapsed in the Senate, intensifying fears about a protracted global slump. More dire economic data from the United States — a vital export market — and news of deep job cuts at Bank of America also added to the gloom. Japan's Nikkei 225 stock average tumbled 484.68 points, or 5.6 percent, to 8,235.87, and Hong Kong's Hang Seng index slid 6.7 percent to 14,577.67. South Korea's Kospi fell 4.4 percent while markets in Singapore, Australia, China and India fell between 2 percent and 4 percent. The dollar fell to a 13-year low against the yen, dropping as low as 88.16 yen, and oil dropped below $46 a barrel. Investors were rattled after a $14 billion bailout for Detroit's struggling Big Three automakers failed to get approval in the U.S. Senate. The collapse came after bipartisan talks on the auto rescue broke down over Republican demands that the United Auto Workers union agree to steep wage cuts by 2009 to bring their pay into line with Japanese carmakers. The bankruptcy of any American automaker would deal another major blow to the American economy, already in recession, and ripple through export-dependent Asia, as well as global financial markets. "If a company such as General Motors filed for Chapter 11 bankruptcy protection it could strike the Dow below 8,000 again," said Jackson Wong, investment manager at Tanrich Securities in Hong Kong. "Even though China's government has been announcing plans to support the markets and the economy, Asia would follow Wall Street down," he said. "This very negative news is just an excuse for people to take money off the table." Hopes for the U.S. auto industry now appear to rest with President George W. Bush agreeing to tap a $700 billion Wall Street bailout fund for emergency aid. General Motors Corp. and Chrysler LLC have said they could be weeks from collapse. Ford Motor Co. says it does not need federal help now, but its survival is far from certain. News of the Senate's rejection sent the dollar as low as 88.16 yen — its lowest level since Aug. 2, 1995 — before it recovered some to 89.70 yen. That heaps more bad news on major exporters like Toyota and Sony, already reeling from waning global consumer demand. Auto stocks from Bangkok to Tokyo plummeted. In Tokyo, Toyota Motor Co. dived 10.6 percent and Honda Motor Co. slid 12.9 percent. South Korea's Hyundai Motor Co. shed 8.5 percent and Kia Motors Corp. was off 8.4 percent. Thailand's AAPICO Hitech, an auto parts maker, fell 4.2 percent. There was also more grim jobs data from the United States with new unemployment benefit applications in the week ending Dec. 6 rising to a seasonally adjusted 573,000 from an upwardly revised figure of 515,000 in the previous week. The reading was the highest since November 1982, though the labor force has grown by about half since then. Bank of America Corp. announced it expects to cut 30,000 to 35,000 jobs over the next three years. The Dow Jones industrial average Thursday fell 196.33 points, or 2.2 percent, to 8,565.09. Futures pointed to a sell-off Friday on Wall Street. Dow futures were down 286 points, or 3.3 percent, at 8,311 and S&P 500 futures slid 37.30 points, or 4.3 percent, to 837.20. The past week of gains in world markets was "more predicated on hope than reality," said Arjuna Mahendran, head of Asian investment strategy at HSBC Private Bank in Singapore. "This has been a typical bear market rally. It's been based on very high expectations of Obama's fiscal stimulus plan. It's been based on expectations and nothing else," he said. President-elect Barack Obama last weekend flagged a massive stimulus package for the U.S. economy once he takes office in late January, pledging the largest public works program since the creation of the U.S. interstate highway network a half-century ago. In Hong Kong, financial stocks sank. Industrial & Commercial Bank of China, the mainland's biggest commercial lender, tumbled 5.8 percent. HSBC fell 4.4 percent and China Construction Bank slid 7.2 percent. HSBC's Mahendran said investors were facing a reality check after earlier this week shrugging off dire economic data from the U.S. and China including the loss of more than half a million American jobs in November. Another round of deep interest rate cuts by central banks in South Korea and Taiwan on Thursday underlined the dire state of the world economy, he said. "Central banks are in a race to the bottom. The Fed will probably cut half a point to 0.5 percent next week and by March next year U.S. interest rates may be zero," Mahendran said. Oil prices retreated after jumping the previous day. Light, sweet crude for January delivery fell $2.32 to $45.66 a barrel in electronic trading on the New York Mercantile Exchange by midafternoon in Singapore.